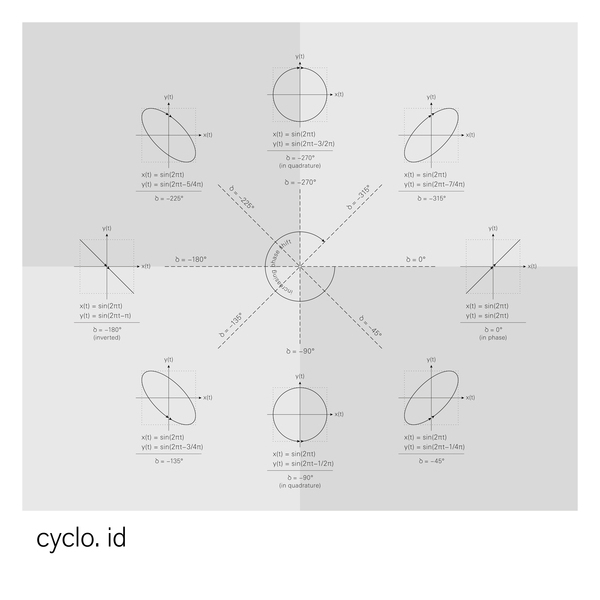 Ryoji Ikeda and Carsten Nicolai first premiered their collaborative Cyclo project a deacde ago on Raster Noton. Relaunching in 2011 they're just as intent on creating a synaesthetic visualization of sound that "...seeks to create a new hybrid of visual art and music". Essentially the sounds on 'Id' are inextricable from their visual corollary. They're the unmastered sonic illustrations of detailed graphical data, and vice versa, developed from a database of sounds composed to produce visual responses when analysed in real time with the help of stereo image monitoring equipment. Most importantly, the sounds are subservient to the image, hence the record remains purposefully unmastered in order to retain the waveform's original integrity when visualized through an XY phase scope, transcending the usual sound>image dynamic. But that's not to say that the music doesn't possess its own heightened, strangely affecting quality - within 30 seconds of listening through headphones this reviewer's eyes were watering, a physically visceral effect if we've ever felt one. Unlike its relatively austere predecessor, the sounds within cover a wider spectrum of rhythms, from spasmodic digital pulses to lightyears-advanced electro syncopation, and similarly a dazzling frequency range capable of causing acutely synaesthetic reactions. All this leads us to think that 'Id' is a work of uncompromising genius, at once cementing and advancing Ikeda and Nicolai's relentlessly ongoing audio/visual quest.